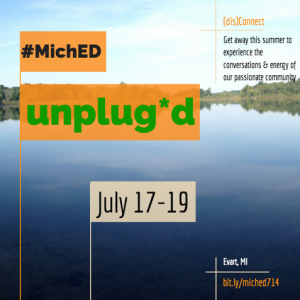 #michED Unplug’d – Join us for a Weekend of Connecting! When the #michED community was born, it wasn’t built on the premise of simply playing copycat to the popular #EdChat movement. Jeff Bush and I wanted to create a community that was responsive to and comprised of Michigan educators. We welcome participants from out of state, but the core of this community to to help uplift the talented educators, students, and positive learning environments across Michigan. With the goals of sharing great student learning and connecting educators, we wanted to create a vibrant space online where educators and students around the state can share positive stories, achievements, and trends in our classrooms. We always knew that including as many voices as possible was essential for our community to grow, and thus the #michED podcast was born through the talented work of Brad Wilson. The ever-growing list of educators that I feel obligated to praise whenever I write about #michED continues to grow. The “behind the scenes” chat team now includes over a dozen educators from around the state, working in concert to produce one of the finest education-based Twitter chats focused on sharing and learning from the experts in our classrooms everyday. 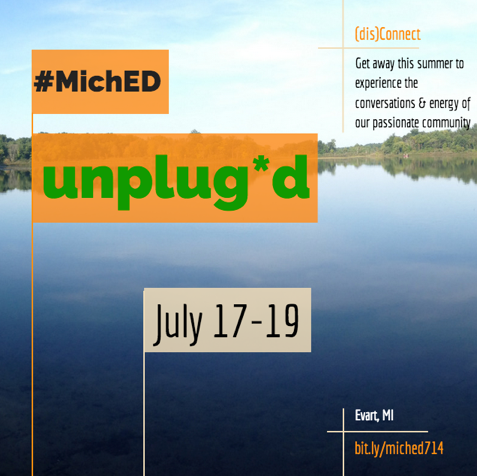 But leaving the conversation to the digital realm wasn’t enough, and the idea for #michED Unplug’d was born. This July 17th, 18th, and 19th, a small intimate gathering of educators from around the state are invited to enjoy a few days of “unconnected” face to face conversations, collaboration, and bonding, as we attempt to push further on making the #michED movement for positive sharing and connections a permanent piece of the education landscape in Michigan. Come join us for an evening or two in Evart, MI at a humble B&B this July, and stay tuned to the #michED website for more info!